Candida is a common yeast. It is in small amounts present in the mouth, mucosa and skin of all people. The numbers of yeast organisms are normally kept in check by the other microorganisms that live on these tissues. Circumstances such as illness, medication and stress can disturb the balance that can cause uncontrolled growth of candida yeast. Candida in the mouth is also known as oral candidiasis. 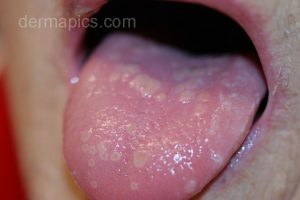 candida infection of the mouth: white spots on the tongue that can be rubbed off. White, slightly raised lesions develop in the mouth, especially on the surface of the tongue and the mucosa of the cheeks. They can be scraped off, sometimes leading to a little bleeding. 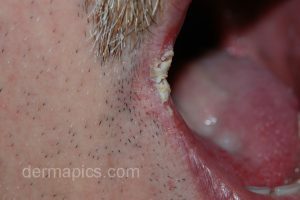 Candida can also occur in the corners of the mouth. The cause is often prolonged exposure of the corners of the mouth to saliva. Ill-fitting dentures are a well known cause of this. In persons with a competent immune system candida in (or around) the mouth can be effectively treated. Medication is available in liquids and lozenges. In more serious cases oral medication may be prescribed by your doctor. In patients with a weakened immune system (HIV, cancer or certain medication…) symptoms may be more severe and more difficult to manage. It is important that possible underlying health problems are diagnosed and treated. Shankargouda P et al: Clinical Appearance of Oral Candida Infection and Therapeutic Strategies. Front Microbiol. 2015; 6: 1391.